The MPPT Charge Controller | Why You Might Need One? The maximum power point tracking… MPPT charge controller … has got to be one of the most innovative, game changing and misunderstood components in the solar industry. There is so much misinformation, it is time to clear up the myths of the MPPT charge controllers, explain what they do and explore what they cannot do. Here is the MPPT solar controller in the shortest description…don’t worry…this will all be explained later. 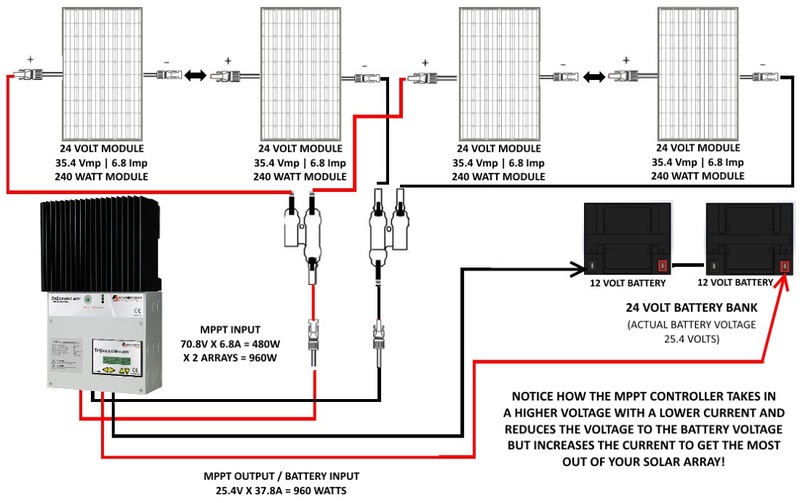 #1 MPPT charge controllers attempt to connect to the solar module at its MPPV (maximum power point voltage or “sweet spot” voltage (which is the voltage when the solar module’s voltage multiplied by the solar module’s current will produce the most electricity). #2 Maximum Power Point Tracking charge controllers then connect to the battery at the battery’s voltage (while increasing the amperage) to collect as much electricity as possible. #3 MPPT controllers also act as charge controllers that make sure your battery bank is never overcharged by performing BULK, ABSORPTION, FLOAT and EQUALIZATION charges to make your batteries last as long as possible. THIS CAN BE VERY DIFFICULT TO UNDERSTAND SO WE WILL DO OUR BEST TO EXPLAIN IT! SOLAR MODULES NEVER PRODUCE THEIR RATED POWER !!!!!!! They just CAN’T and DON’T! But MPPT (Maximum Power Point Tracking) will make a huge difference in some situations. STC assume the solar module is held at 25 degrees C.
Let’s look at this. First we have to realize there has to be some way of comparing solar module’s that is not an apples to oranges comparison. If not, any manufacturer could say anything about their solar modules and there would be no way to prove or disprove their claims. That is why Standard Test Conditions (STC) were established. All solar modules are tested and rated according to this hypothetical situation that the sun is beaming 1000 watts per square meter of ground in your location. That means that in a perfect world, 1000 watts of heat (energy) is being absorbed (for every square meter of earth) where and while the sun is shining. This rarely (if ever) is true. Even if it is true, the solar module would have to point exactly at the sun horizontally and vertically for STC to be accurate. Interesting Fact: If solar modules were 100% efficient, a 1000 watt solar module would only be one square meter in size. However as solar modules are roughly 10-20% efficient, it requires 5-10 square meters of physical space to make a 1000 watt solar module (if 1000 watt solar panels actually existed). It doesn’t take a rocket science to see how rarely this would happen. Solar modules are in the sun. The sun heats the solar module. Unfortunately, the hotter the solar module is, the less power it produces because the voltage decreases. Just a fact. Nothing we can change other than making sure your modules/solar array have ventilation (air gaps and spacing) to help keep them as cool as possible. “the colder the solar module is, the more power it will produce as the voltage increases”. This can be a good thing for those in very cold locations. I have seen solar panels exceed their manufacturer’s voltage rating (and output) by as much as 15% in -30 degrees Celsius but your tongue will stick to the aluminum frame of the solar panel at that temperature. Try to resist. ALL SOLAR MODULES ARE CURRENT LIMITED! Solar modules are current limited. They can only make a certain amount of current no matter how bright the sun is. This is usually referred to as the short circuit current, Isc (I for current, sc for short circuit), Is.c., maximum current and a few other terms depending on the manufacturer. Think about it: Let’s pretend we have a 200 watt solar module that is rated to produce 10 amps @ 20 volts (10A X 20V=200W). EVEN THOUGH THE BATTERY VOLTAGE MAY BE SIGNIFICANTLY LOWER THAN THE SOLAR MODULE’S “MPP” or “SWEET SPOT” VOLTAGE, THE CURRENT COMING FROM THE MODULE WILL NOT INCREASE !!! 24.0 volts X 7.50 amps = 180 watts. If, and only if, the voltage being produced by the solar module is 24.0 VDC, will the SCHUCO solar module produce 180 watts. If the output voltage is any less, so will be the output in watts. a specific voltage called the “maximum power point voltage”. All solar modules have a specification sheet and a sticker on the rear of the module telling the maximum output (in watts) and how the company attained (and proved) that wattage output. What we need to look at is the Vmp (maximum power point voltage) and the Imp (maximum power point current). Those numbers are essentially the “sweet spot” of the solar (or the voltage and current when the module produces the maximum or rated output). We know that VOLTS X AMPS = WATTS, so when when we look at the Canadian Solar 260P we see its maximum (or rated) power is attained when the voltage is 30.4 and the current (amperage) is 8.56. BUT WHAT IF THE BATTERY VOLTAGE IS ONLY 24.6 VOLTS? Now we need to change things up a bit and use the Isc or short circuit current because that is the maximum current (amperage) the solar panel will produce when the voltage is lower than the panel’s MPPV (maximum power point voltage) no matter how low the voltage is. Isc (maximum current/short circuit current) is 9.12 amps. BUT WHAT IF THE BATTERY VOLTAGE IS ONLY 21.0 VOLTS? First of all, that is one seriously dead battery bank. Don’t do this to your batteries! For a moment, let’s pretend we are incompetent and we used Canadian Solar’s CS6P 260P on a 12 volt battery bank with a standard charge controller. Those above numbers are not exactly what we hoped for when we paid good money for every watt a solar module is supposed to produce. no matter what (or how low) the voltage is. This is the where the MPPT solar charge controller rises above all the others! It is hard to explain the maximum power point tracking charge controller (MPPT solar charge controller) without mentioning the first attempts at solar charge controllers or battery voltage regulators. In the beginning there was the battery and the solar module. Solar modules were connected to a battery directly or with a non MPPT controller (with or without over-current protection) and the results were less than impressive. With these issues, we were lucky to get 50-60% of the solar module’s rated wattage into our battery without a charge controller and 60-70% of the solar module’s rated wattage with a standard solar charge controller. This was a VERY exciting time for solar energy professionals. The first “REAL” high quality MPPT solar controller was designed by the “old TRACE ENGINEERING” boys when they left Trace to found OUTBACK POWER SYSTEMS. As discussed earlier, the higher the temperature of a solar module the less output (in watts) it will produce. Do your best to keep them cool by having an air space under the modules especially on a roof mounted solar array. But imagine you have a 12VDC battery bank and a solar module with an output of 17 volts. The battery voltage is 13.8 volts and temperature is a mere 40 degrees C. The solar module’s voltage will drop significantly as the module is likely closer to 50 degrees C as it is dark colored and hot. Now you have a solar module that is nothing but a pretty ornament. The solution? Install two modules in series for 34 volts and use an MPPT controller to reduce the voltage to 12VDC. BLOW UP IF THEIR MAXIMUM INPUT VOLTAGE IS EXCEEDED! Let’s imagine we purchased a maximum power point charge controller with a maximum voltage input of 150VDC like the FM60, FM80, Apollo T80 or otherwise. Let’s suppose you build a solar array that has a MPV of 145 volts at 25 degrees C (STC) and you live in an area that can go down to -40 degrees C.
Either the battery voltage is too low, or the temperature is too high or there is fog, clouds or a number of other problems. As we know that the watts out of a given solar module can be found by multiplying the volts x amps, we must try to keep those factors as high as possible to get the most out of the solar module. At what point does it make sense to spend the extra for an MPPT controller? We love having an MPPT charge controller, and it’s not because of the “boost”. You mention the advantage of charging a low voltage battery with a high voltage array, but just to spell out one of the practical upshots of that: Overcast days can yield more charge into your batteries. With panels “matched” to battery voltage, an overcast day causes array voltage to drop, and before long it’s too low to push current into the battery bank, especially if you’re in absorb stage. Our array is “48V” but batteries are only 12V (this is in an RV). So even when the array is barely making power on overcast days, it’s still “only” putting out 20V or so, which is still enough that the charge controller can push current into the batteries at any stage of charging. This wouldn’t be possible with any other type of charge controller, as the full-sun output of the array could not be “stepped down” far enough in good conditions, and something would fry. We’ve gone through 4- and 5-day grey spells this way. I have seen 300W coming out of our 1200W array /during/ a rainstorm. Also while being snowed on. “So even when the array is barely making power on overcast days, it’s still “only” putting out 20V or so, which is still enough that the charge controller can push current into the batteries at any stage of charging. This wouldn’t be possible with any other type of charge controller, as the full-sun output of the array could not be “stepped down” far enough in good conditions, and something would fry. I have a Apollo Turbo MMPT which takes the panels at 110v than converts to 24v to charge the bank,,have you heard of these and also what are your thoughts on Nickel Iron Batteries. I have an MPPT charger feeding the front end of my battery bank and a PWM type feeding the other end. This combo of chargers has seemingly done the banks some good. They are pretty much always up. But I did not know that the PWM style allows power to flow backwards to the panels at night!! Is that right?